The Draper 60 x 80" Luma Manual Projection Screen is attractive and dependable in the classroom or conference room. Its case and endcaps have a matching finish. Heavy gauge endcaps form universal hanging brackets for attachment to wall, ceiling or map rail hooks. The Auto Return feature gives you the luxury of returning the screen to its case with a nice, even roll instead of the entire screen flapping up with much noise. In addition, the screen can be stopped at various increments during its deployment. This entire mechanism benefits the owner since it minimizes damage to the dowel on which the screen is mounted. At a very reasonable price, the Luma should be considered almost a necessity for boardrooms, classroom, and lecture halls. It's simple but rugged and reliable design make it a more than desirable item for office design. 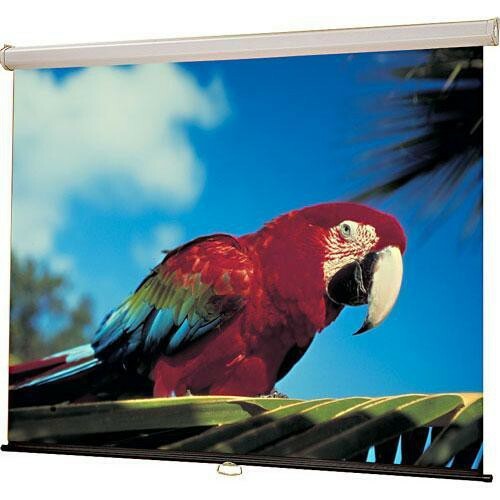 207118 Luma Manual Projection Screen with Auto Return (60 x 80") is rated 3.0 out of 5 by 1. Rated 3 out of 5 by Tech Guy from Quality Material, Bad AutoReturn Purchased this screen 11 months ago for a church. They use it once a week. The screen material is great - brightens up the projector we use, and is much better than just shining it on the wall. It has a black border which 'trims' the image nicely. The Auto-return feature is nice. It retracts like normal until about a foot away from the top, then slows down to a gentle speed until fully retracted. Saves the audience from those old-school screens that'd slam into the tube and scare half the class. It worked fine for about 3 months. Then the auto-return mechanism broke. It'd take 5-7 minutes for the screen to retract from fully extended. Didn't matter how much you wanted it to return, it just took it's sweet time. A month ago, that mechanism broke. It now slams into the tube. The screen still works, but the price premium for the AutoReturn isn't worth it.